HB B-24J "Going My Way"
Ok. Maybe. Despite all the debate and shortcomings with this kit, I just can't resist. This obviously won't be a quick build. I have various AM products--Airscale instruments, some nice radio gear and oxygen bottles on order from http://resin2detail.com as well as a bombsight from a different seller (can't remember right now. Age!). Seatbelts from Spruebros....let the fun begin! First off, interior color. 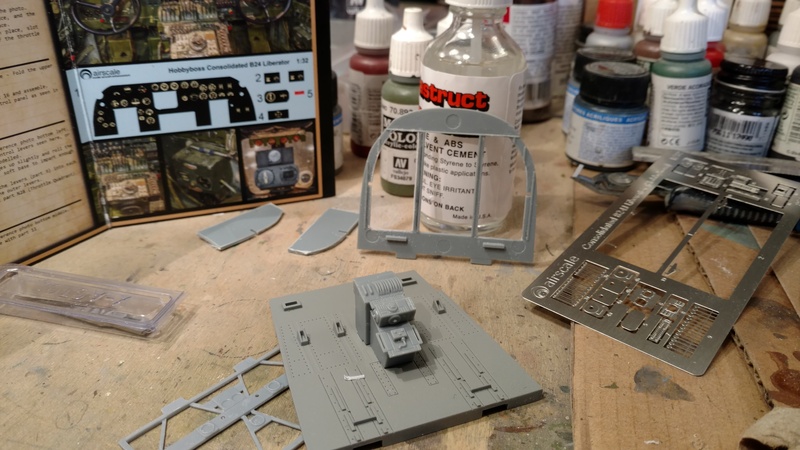 Neutral grey for the bomb bay? For an NMF Lib? And I was thinking interior green or bronze green cockpit area, NMF everywhere else. This is a CO B-24, so it could be pretty standard. Or not. Not sure if 11th AF did any unusual mods like 5th AF did. But I will need an additional tail turret sprue as GMW had an A6C front turret. So if anyone is willing to part with theirs for trade ot whatever I'd be interested. Will follow! The more the merrier. I'd go with 'stark'... Good luck with this build. Following. Will you do the wing mod that Iain is doing? Yeah, definitely following that but not sure I'm up for that level of surgery. I can't help you with the colors but I would like to follow this. Will follow with interest. This kits on my shopping list once the bank balance recovers from purchase of a certain Lancaster ! Early work, mainly cutting open the bulkhead behind cockpit. Wasn't able to find the brass landing gear inserts--who makes them again? And interior color. Good Lord, what a mass of contradictory info. Dark Green? Zinc Chromate? Interior Green? Unpainted? My instinct is still to go with either interior green or a dark dull green for the pilot/forward compartment, and NMF for everything else. Some good photos out on the interwebs, but they appear to be mostly D models or restored aircraft where you can't be sure of the accuracy of the paint jobs. Anybody else have a favorite scheme they're planning on using? Good luck with it Tim! It'll be quite some time before I get to mine, but I'll be following yours with interest. For what it's worth, I agree with Dark Dull Green as you've said, if nothing else then I think just for the look. Yep. Painted the cockpit floor and some other bits in aluminum first, then the green, then the scratches and scraped (pics to follow). The kit includes what look like headrests on the seats. I don't think I've ever seen those in photos of B-24s (I even reviewed the opening sequences of Unbroken, like I needed an excuse). So I'm leaving those off. More to come, I hope, though this is turning into a busy week. Its been left as was so pretty beaten up but dark dull green, zinc c, bare metal, neutral grey... all in there. I've literally just had mr paint dark dull green arrive to go with their other USAF interior colours. I'm using Vallejo Bronze Green, lightened a bit here and there with olive green. Seems to be working. I may continue this as part of the Group Build, assuming I can still do that.